Google Reader and GTaik are my favorite program among Google services.I don’t like to open up another window or tab running these two program,normally i put it into my Firefox sidebar and can view it all the time.Before i have a post showing how to put Google reader in Firefox sidebar,now i showing how to put GTaik into Firefox sidebar. 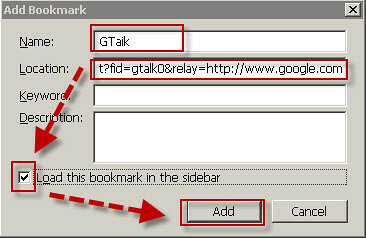 2.Enter ‘ http://talkgadget.google.com/talkgadget/client?fid=gtalk0&relay=http://www.google.com ‘ in Location column and put a check in ‘Load this bookmark in the sidebar’ ,then click ‘Add’ . 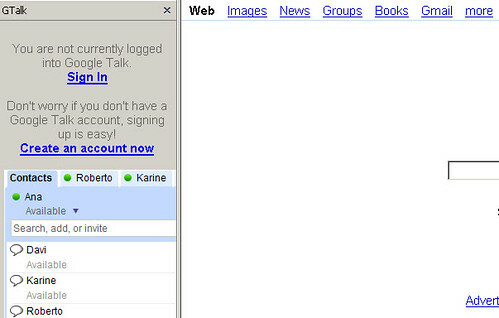 3.Next time if you click for this bookmark,GTalk will create at Firefox sidebar .